I have to confess, I’ve never been much of meatloaf fan. In my head it’s always reminded me of something you’d see on Kevin Arnold’s plate (in case you’re too young, that’s a Wonder Years reference :)). 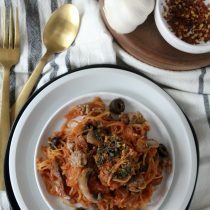 But I know it can be an easy dish to make and I figured I could make it delicious and paleo. Not just your average pile ‘o meat. And I did! First off, it’s super easy to make paleo as it was easy remove the grain from I just swapped in some almond flour. I’m leaning towards thinking that the almond flour lends itself to keeping this meatloaf moist and prevents it from drying out. And second, I have to say that the tomato glaze I came up with for the top is better than any sort of store bought ketchup you could add. 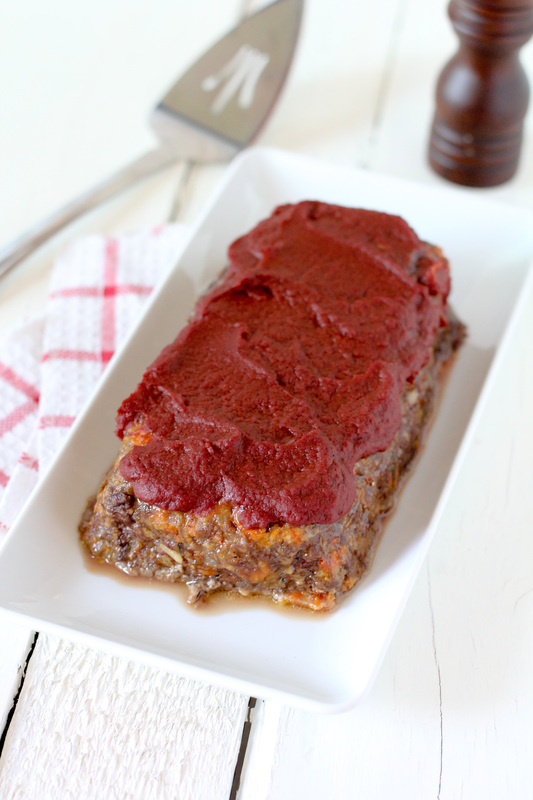 I feel like I need to write a lot about the meatloaf. Telling you how juicy it stays, how much flavor sautéing the veggies ahead of time adds, etc. etc. Maybe even dig in to the history of it. But I’m not so into writing mode this morning, apologies. Most days I have it in me but some days I’m at a loss. 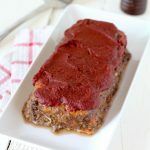 Rather than sot here for the next hour wondering what you want to know about meatloaf I’ve decided to just let it be and get you the important part. The recipe. With that being said, you’re just going to have to take my word on this… It is SO easy and really delicious. Holy moly, this is AMAZING! I used ground deer meat and almost doubled the recipe so I tweaked some portions of spices and used all dried herbs, including onion, but this stuff is AMAZING! Very easy! Whipped this up last night for my meatloaf loving boys. Huge hit! Thank you once again! After years of not making meatloaf, I found this recipe and gave it a try last week. My whole family was over the moon!!!! My husband asked me to make it again tonight! 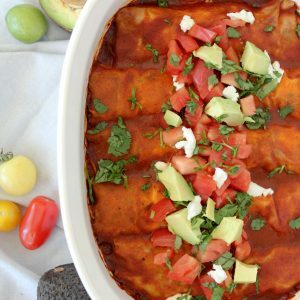 This recipe is definitely going into rotation! Thank you! !